Well you can call me Bertie bacon balls! Take a look at this beauty, yet another Musson vs food USA challenge. Tonight’s contender.., a B(BBBB)LT. This pig in a sandwich features, a lettuce leaf, a couple slices of tomato oh and 1lb of Bacon thrown in for good measure. 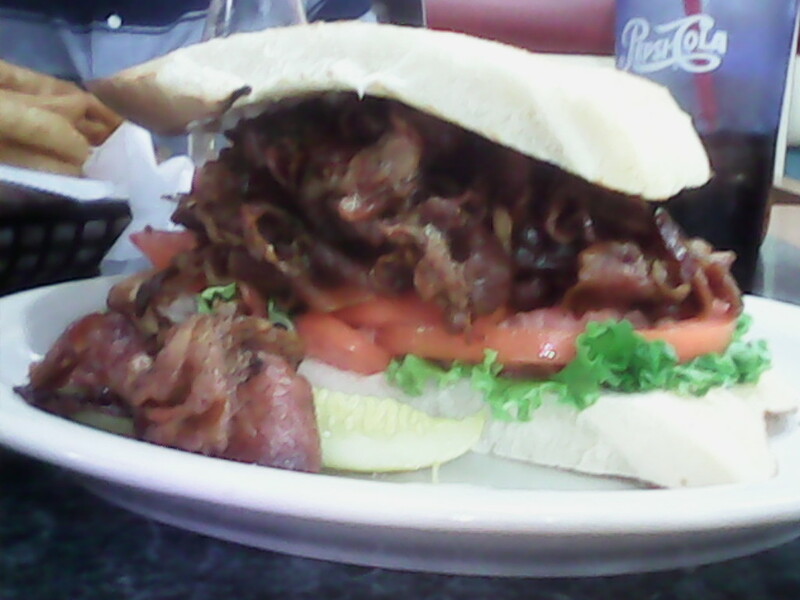 The belly busting heart stopper is from Tony’s restaurant, Birch run, Mi… Featured on TV for its er… Crazy big BLT. Pretty damn tasty, I didn’t finish the sandwich, it finished me… maybe a handful of bacon and half a pickle left. I really had no more to give, a fair effort I think. Posted on May 27, 2014 May 27, 2014 by themussmarter	This entry was posted in General MussMart News, Michigan. Bookmark the permalink.